From the First Five Years at Hogwarts (Easy Piano Solos). 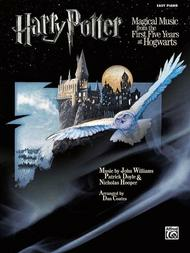 Composed by John Williams, Patrick Doyle, and Nicholas Hooper. Arranged by Dan Coates. This edition: Easy Piano. Piano - Easy Piano Collection; Piano Supplemental. Movie. Book. 76 pages. Alfred Music #00-32712. Published by Alfred Music (AP.32712). For the first time ever, musical selections from the first five Harry Potter movies are available in one jam-packed collection. Intermediate-level pianists will love playing these Easy Piano arrangements, which faithfully render the magical music of John Williams, Patrick Doyle, and Nicholas Hooper. Full color art pages from each movie are included. Titles: Buckbeak's Flight * The Chamber of Secrets * Double Trouble * Dumbledore's Army * Fawkes the Phoenix * Fireworks * Hagrid the Professor * Harry in Winter * Harry's Wondrous World * Hedwig's Theme * Hogwarts' Hymn * Hogwarts' March * Loved Ones and Leaving * Nimbus 2000 * Potter Waltz * Professor Umbridge * The Quidditch World Cup (The Irish) * The Room of Requirement.